Ayla is trapped deep underground in a small, tight space, in stifling, hot darkness. It’s a nightmarish situation. She has no idea how or why she is there, and things get worse still when a pack of vile, goblin-like creatures arrive to torment her. It’s a gripping and truly frightening opening chapter. As the story unfolds, we find out why Ayla is trapped. No ordinary schoolgirl, she has great power, but is also a threat to the stability of the world. The jovial uncles who have brought her up are similarly no ordinary men, but warriors assigned to protect her, and thousands of years old. The task of rescuing Ayla will fall to her three best friends, troubled Finn, bookworm Sean, and tomboy Benvy. Irish mythology is ingrained in Matt Griffin’s novel and works to give it a depth and cogency that make it stand out from other fantasy fiction. The three young heroes must undergo trials of strength, and each convinces utterly: as in all myths, the tests are dangerous and difficult, fighting for Ayla involves real pain, but results in greater self-understanding too. 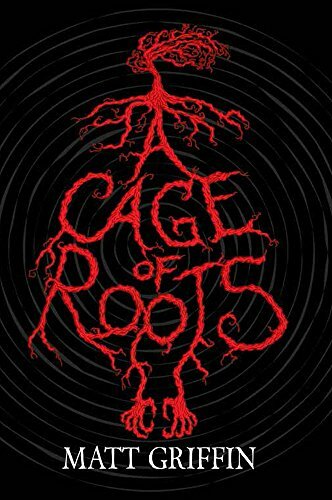 Cage of Roots will probably have particular resonance for Irish readers familiar with the folklore that supports it, but readers without that knowledge may well be inspired to find out more, such is the atmosphere and sense of adventure created by the author. It could well send readers off to find out more about hurling too, which is terrifically well described! At the finish, everything is set for a new adventure and it will be interesting to see where the author takes it. This is an impressive and imaginative debut novel and Matt Griffin’s own brooding black and white illustrations add to the mood of mysticism.